There are those who can exercise for the sake of exercise. Then there are those who need a reason. For those looking for a way to stay on track during the winter, I have the perfect idea: an indoor triathlon. These are great events! Courses are designed around time, not distance. Each leg of the triathlon is run against a clock. Points are given based on how many laps are completed, how far a bike is pedaled, and how much distance is traveled on a treadmill in specific time frames. Plus the event is completely weather-proof. I completed my first indoor triathlon a few years ago at Lifetime Fitness. It was really cool! 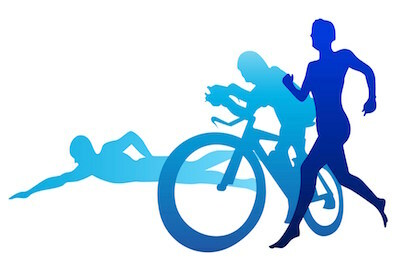 Although indoor triathlons vary from event to event, this competition was broken into a 10 minute swim, 30 minute bike, and 20 minute walk/run. In about an hour I finished a great workout and met some really nice people. No need to be intimidated either. There were a wide variety of people participating. Some were seasoned triathletes. Others were senior citizens. Some people swam like fish in the water and then walked on the treadmill. Then there were novices like me. I wasn’t much of a talent in the pool, but I made up a lot of points on the treadmill. Either way, it did not matter. Everyone was there to have a great race and earn a free t-shirt. I would love to see some of our clients give it a whirl. Below is a link to this year’s indoor triathlons hosted by Lifetime. If you want to brush up on your swimming stroke check your local high school pool for information on when open swims are available. If you have any other questions fell free to email me or if you have participated in an indoor triathlon please comment on our blog.